This is a little outside the normal NUR area of interest but I thought it was an incredible case study into the lack of foresight that many of our cities and subdivisions have around connectivity and the importance of the effective network. The case relates to the Crooked Creek subdivision in Milton that is located along highway 9 between Bethany Bend and Francis Rd on the west side of the highway. The golf subdivision is looking to install gates to curb 'cut-through' traffic. (Full disclosure, I live in a gated subdivision and would prefer that the gates be removed lest ye think me a hypocrite) There are a couple hurdles Crooked Creek must clear before it can be done and I'm completely uninformed as to the prospects but I'd wager that it passes both. The first is the 67% HOA vote. The second is approval from the city. The criteria for city approval is basically whether it is in the best keepoing of the community and the city and that it does not impact the surrounding community. The city will no longer have to maintain ~7 miles of road which is a huge plus. But, at the same time, its grid is being clipped and there will be one fewer connection in an area that is already, and will be moreso in the future, starved for connectivity. I'm not sure what is worth more and Milton will ultimately need to decide on that but I generally side on more connectivity and you could definitley argue that gating this subdivision will negatively impact the surrounding community. There are ways to make roads safe, even for children, without gating them. The main road, Creek Club Dr, is WIDE and thus encourages and accommodates higher speeds. The lanes are 12 feet in each direction. That's as wide as an interstate lane. No wonder Crooked Creek has a speeding problem on their 'cut-through' road. Pinching in the road and adding traffic calming would significantly reduce speeds while still enabling connectivity. I use Vickery Village frequently to illustrate a place that has high connectivity with safe driving speeds. Anyone can drive in Vickery and kids are ALL OVER the place. The car just isn't given free reign to drive at unsafe speeds. Ultimately, if you narrow the roads and you increase safety. Gating this subdivision will hinder connectivty and will significantly reduce pedestrian and bike options for those living around Crooked Creek. They are already almost non-existant but that doesn't mean no effort should be made to keep what little connectivity exists. For additional insight, check out the NorthFulton.com article on the subject here. This is an enhanced cross-post from my montly column, Community Design Matters, in The Current. There may be some editorial differences. How many houses per acre are in your subdivision? How many are allowed? How does that make you feel? Should you feel anything at all? I say no and here’s why. The numbers tell you the density of a given place. The numbers associated with density tell you absolutely nothing about that place other than how many people or separate dwellings are located there. It is a hollow word that says nothing about the charm and lovability of a place. Density is the number of individuals or dwelling units per unit of area. The making of vibrant, diverse, and exciting urbanism is directly related to the concentration of population and activity. Density ensures the greatest range of people, buildings, public spaces, facilities, services, and choices. It promotes the easy exchange of ideas and goods and services.. If density ensures the greatest range of people, buildings, public spaces, facilities, services, and choices, why do people generally flip out when anything more than 2 units per acre is proposed in their neighborhood? The word has a stigma and it does so by failing to capture context. The NIMBY response to density has its roots in many misconceptions about density’s relationship to social ills that have been associated with it such as crime, traffic, poor schools, low property values. etc. The thing is, correlation and causation can often be miles apart. Other misguided reasons people give such as they don’t want to be packed in like sardines and they aren’t going to give up the American Dream. Once again, density does a poor job describing an environment. Take Vickery Village or Seaside as examples. These are places where single family homes dominate the landscape but the design increases the density and comfort of the place incredibly well. The real reason for the NIMBY reaction, in my opinion, is that builders have done it so wrong for so long that virtually every building associated with density in a suburban setting is absolutely god awful, reprehensible, cookie cutter design that should be punished by revocation of architectural licenses. You don’t see the ills in places where density has been done right. Virtually all of the world’s top tourist destinations are highly dense areas where people live, work, learn and play in very close proximity. With the exception of landscapes, people don’t take pictures and send postcards of places that don’t have some minimum amount of density. You don’t get excited when you receive a postcard of Martin’s Landing, even the well photoshopped ones. People like to see and visit highly beautiful, dense urban areas. Think of Paris, Rome, Santorini, Prague, Seaside, Savannah or Charleston. ..density is an expected byproduct of a successful place, not the implement by which we create one. Maybe this is why Historic Roswell has the most examples of density done right in the northern suburbs. The Bricks, Founders Mill and Canton St Walk/Providence are all excellent and complement the success of the neighborhood. Unfortunately, there aren’t more. Take away these three, and you have literally hundreds of poorly planned, improperly located and shoddily constructed condos, townhouse and apartments sprinkled all over the city. We must do better and cities MUST stop allowing condos, townhouse and apartments to be built where they don’t belong. They belong in the centers of our villages and towns and not anywhere someone can make a buck. More importantly however, people need to understand that density isn’t the issue. Design and location the things that should concern you. Community Design Matters Especially if you want "Density Done Right." This video is a fun exercise to see if you can guess the density. You will quickly learn that the number isn't the issue. This is a cross-post from my montly column, Community Design Matters, inThe Roswell Current. Recently, I wrote about the Elusive Neighborhood Grocery Store. A number of readers wrote me with disappointment that we have so few here in the northern ‘burbs.' I’m disappointed too. But, there is something even more elusive in our part of metro-suburbia that is even harder to find—The Elusive Walkable Neighborhood. The first thing I want to point out is this: There are Neighborhoods that are Subdivisions but not all Subdivisions are Neighborhoods. Atlanta’s northern suburbs are largely made up of subdivisions that people call neighborhoods because our country has lost so many true neighborhoods that people don’t even know how to recognize them anymore. A place with houses has become a neighborhood. The second thing I want to point out is that a walkable neighborhood almost always has sidewalks but a subdivision with sidewalks is rarely a walkable neighborhood. Okay, you say… you just dissed my subdivided lifestyle, so tell me, Mr. New Urban Smarty-pants, what is a walkable neighborhood? First and foremost, a walkable neighborhood is a place where people generally prefer to walk because it feels comfortable and interesting. Use the following question as a litmus test. When driving, do you feel the urge to get out of your car and walk? If the answer is no, you are probably not in a walkable neighborhood. If the answer is yes, you have probably found one. There are other ways to test walkability. The most popular is Walkscore, which is a place whose value of 0 to 100 is based on the amenities in close proximity of a given address. Check yours at walkscore.com. You can also use the immeasurable rules of Walk Appeal coined by architect Steve Mouzon — people on the street, lovable things along the way, magic of the city, safety, nature, and sound. These are all things that impact whether you will walk somewhere but probably don’t enter your thought process when deciding between your shoes or your keys. Another easy rule of thumb is that people are generally not willing to walk more than a quarter mile to get to their destination if a car is readily available. Exceptions to this occur in places with high Walk Appeal, where the walk is broken up by many interesting ‘distractions.’ These distractions are generally people, shops, or interesting views (natural or manmade). Places like Paris, New York City, Savannah and Charleston are great examples of places where people are more than willing to walk long distances. Places like Windward Parkway that have sidewalks do enable walking but don’t have high Walk Appeal. It gets a Walkscore of 12. Walkability is a key component of a true neighborhood. Neighbors don’t meet each other driving from their garage to the big box store du jour and back to their garage. They meet each other on foot. Much of this happens while walking. Walkable neighborhoods promote neighborliness. Neighborhoods with a mix of interesting destinations within close proximity that are accessible by foot promote walking. Walking promotes better health, better social capital, and less foreign oil consumption. And walking under the influence rarely results in serious injury. Now that TSPLOST has failed, maybe we should move in the opposite direction and focus less on roads and transit and more on sidewalks and proximity. "From 2000 to 2010 the City of Atlanta added 3500 residents. Suburban Alpharetta added 22,600. Please spare me the urbanism talk." First off, if you would like to follow Jimmy on Twitter his handle is @jimgilvin. He is often entertaining and I appreciate an elected official being active in social media. It is definitely a risk. That being said, I had to take a look at his stats (which are correct) out of curiosity since my blog is primarily about New Urbanism. The data from 2000 to 2010 pretty much shows that it was business as usual for the suburban experiment. This isn’t really much of a surprise. I wondered if anything had changed since those nubmers came out last year because everything that I’ve read recently points to a renewed interest in walkable urban environments as a preference over the drivable suburban environments that have dominated population growth over the last 40-50 years. Interest in walkable urban environments started to pick up around 2004-2005 and a lot of condos started to go up in the denser areas of the region, most notably in Midtown and Buckhead. But, there was also a lot of development that broke ground around our traditionally suburban city centers that could also be deemed walkable even if it wasn't as intense as what was going on in the urban cores. A lot of this development was crushed by the economic downturn and still hasn’t fully recovered. All types of development suffered this fate whether it was walkable urban, drivable suburban, single-family, multi-family, single-use or mixed-use. There was no single boggieman here. We are starting to see some signs of recovery in all of the aforementioned areas. My expectation is that over the next two to three years, we will start to see more walkable development pick up steam again as you see condos, townhomes and apartments start to go up around the region. Most of this will occur in the centers of our suburban towns. I think this is ringing true in the more current stats. The latest population estimates as of July 2011 show a much different story. In the period from April 2010 through July 2011, the City of Atlanta's population growth, 3%, exceeded much of the region as new buyers and renters started filling in much of the empty development that was left unoccupied after the real estate crash. The Atlanta condo market is healthier than it has been in years. Many of the high profile condo buildings that were noticeably empty for years have hit the tipping point where 70% of their units have been sold. This threshold makes financing much easier and will accellerate the sale of the remaining units. Additionally, a significant amount of apartment capacity is going up intown. What I'm saying here is that the trend is looking favorable for walkable urbanism. Most drivable suburban areas are growing but at a slower clip. In fact, the ONLY suburban market that exceeded the city of Atlanta's growth on a percentage basis between April 2010 and July 2011 was North Fulton. The US Census estimates show that the city of Atlanta added 12,424 residents during that 15 month period. This was the most of any city in the metro area. There were only 7 cities with over 20k residents that exceeded that growth. Five of them were in North Fulton (Alpharetta, Johns Creek, Milton, Roswell, Sandy Springs). The other two were East Point and Union City. 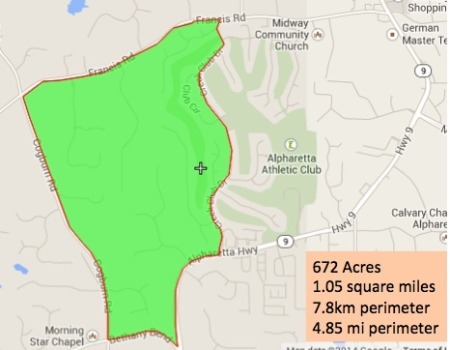 North Fulton, specifically Alpharetta, is not your typical suburban environment. It is a Technology hub that functions as a job center. It has much more wealth than most of the other suburban areas on the region. Most suburbs do not have the same inherent benefits that North Fulton does. Boomer and Millennial demographics are pointing toward a very large demand for walkable urbanism over the next 10 to 15 years as boomers downsize and millennials buy homes. Much of this growth in walkable urbanism will be in areas that have been traditionally labled the suburbs. Just look at where the most talked about areas are in your suburban city. They aren't the newest golf, tennis or gated subdivision. They are the city centers with lively environments of shops and restaurants. The suburban experiment is almost over and it is even coming to an end here in North Fulton. People want places where they don't have to rely 100% on their cars to live their lives.